If you appreciate the bold and stylish look of the Jeep Renegade, you’re going to love the updated features and benefits of the 2017 Jeep Renegade in Colorado Springs, CO. Available in traditional colors in addition to daring, eye-catching hues, the Jeep Renegade is ready to be your night-on-the-town vehicle or your next legendary off-roading SUV. Regardless of what your next adventure is, the 2017 Renegade is ready to have some fun! Here’s what the Renegade has to offer on all its trim levels for 2017. Choosing from six models isn’t easy, but Jeep makes the Renegade irresistible for those that love the bold body and rock-climbing capabilities you’d only find in a Wrangler. Combine this with added features like the capless fuel tank and heated mirrors, and Jeep has all the amenities you could wish to choose from in your next SUV. Thinking about the 2017 Renegade for your next Jeep? Come test drive one with us and experience the Renegade like never before! The Jeep Renegade Trailhawk features Active Drive Low and Rock Mode for the Selec-Terrain Traction Management system—modes exclusive to the Trailhawk. The 2.4L Tigershark MultiAir two engine comes standard with 4×4 capability. This is one off-roading vehicle that won’t back down from a challenge! With 180 horsepower and up to 29 MPG, the Trailhawk is ready to climb rocks or cruise in the city. The two 4×4 systems make it easy for you to switch between 2- and 4-wheel drive due to the rear axle disconnect. This smooth transition makes it simple to add torque when you need it and disengage the 4×4 feature when you don’t. Customize your traction based on road conditions with the Renegade Trailhawk. From Auto, Snow, Sand, and Mud, you can have the right capabilities for any condition. Don’t forget the Trailhawk features an additional mode for rock! The 7-inch Driver Information Digital Cluster Display makes it easy to see all your information at a glance. With lots of storage options—including an adjustable cargo floor—you can fit everything you need into the Trailhawk for your next adventure in the new 2017 Jeep Renegade! Featuring a spacious interior with tons of cargo room, the Jeep Renegade Limited gets up to 30 MPG with 180 horsepower. McKinley leather-trimmed seats and Moroccan Sun bezel accents make this vehicle a step-up from your old Jeep. The Limited also has MySky open-air, dual-panel roof. The upgraded interior is ready to provide you with indulgence in addition to a superb driving experience. Red tow hooks (2 in the front, 1 in the rear) and the characteristic 7-slot grille make your Renegade unmistakable as a Jeep. The Uconnect 6.5 NAV is a simple system that makes it easy for you to route where you need to go. The Limited also features available automatic high beam control headlamps to create an improved driving experience. You also have the option of getting the BeatsAudio package, which features a premium sound system with nine speakers, including a 6.5-inch subwoofer. 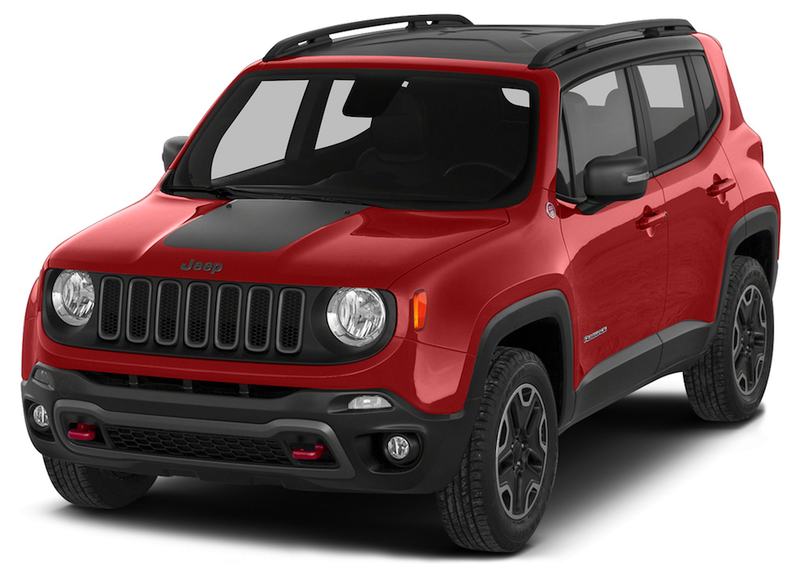 The Renegade Latitude sports a 1.4L MultiAir turbo engine and—you’ll love this—a 6-speed manual transmission. It comes with your choice of 3 different wheel options and automatic halogen headlamps. Your cargo space is amplified by 60/40 split-folding seats in the rear. With up to 31 MPG, the Latitude can get you anywhere with more mileage and less fuel. Add in the 16-inch aluminum wheels and leather-wrapped steering wheel and the Renegade Latitude is looking more and more like your next best trim level. The Latitude also comes in Omaha Orange and Solar Yellow in addition to your traditional colors; these bright shades are something the other Renegade models don’t feature. You also have the option of adding on the Cold Weather Group Package to your 2017 Renegade. This package includes all-season floor mats to withstand any element, and a heated steering wheel with heated front seats. Get to your next destination in comfort and style with the Renegade Sport. This model, like the Latitude, features a 1.4L MultiAir turbo engine and although it has the 16-inch wheels, these rims are black to complement the Sport Renegade. With premium cloth seating and 160 horsepower, the Sport model also comes with deep-tinted glass. On all models of the Renegade, you can opt to get a black roof to contrast with your vehicle color of choice. This wrap-around black roof pairs perfectly with the dark rims in the Renegade Sport. Available roof racks and Keyless Go Button Start ensure you’re ready to go no matter what. A 6-speed manual transmission also comes standard in the Sport with the option for a 9-speed automatic transmission. You also have the option for a 5-inch Uconnect with satellite and back-up camera on the Sport Renegade to ensure safety and take advantage of Uconnect’s possibilities. With colors like Colorado Red, Jetset Blue, and Hypergreen, the Sport model combines comfort with sophistication to style your vehicle no matter what outing you choose to go on. With off-road rock rails and a map hood detail, this Limited Edition Renegade features 180 horsepower and up to 29 MPG. The distinctive seats set this Limited Edition apart and the exterior color choices include Alpine, Anvil, and Black in addition to Mojave Sand, which is exclusive to the Desert Hawk Renegade. The Desert Hawk also features the 2.4L Tigershark MultiAir engine that you find in the Trailhawk. Active Drive Low 4×4 with a 20:1 Crawl Ratio makes this Jeep ready for just about anything. It also comes with the characteristic Trailhawk badging and a MySky dual-panel roof. The exterior badging is customized to the Desert Hawk Renegade with 17-inch aluminum wheels in gloss back. Did we mention the roof panels are removable? Leather-trimmed seats and floor mats for any weather condition deck out the interior of this Limited Edition Renegade. Bronze Moroccan sun accents and a 6.5-inch Uconnect make accessibility a snap. With remote start and ParkView Rear Back Up Camera, the Desert Hawk Limited Edition Renegade is ready to go! The Renegade Altitude has a black interior and exterior in addition to 18-inch wheels to match. These accents add sophistication and an added punch of bold to the Renegade. The black cloth seats, black interior accents, and Uconnect 6.5 make the interior a mix of edgy style and technology. On the Altitude Renegade, you have the choice of the 1.4L MultiAir Turbo engine or the 2.4L Tigershark MultiAir engine. Add in the Selec-Terrain Traction Control System and you have a powerful, capable vehicle on your hands. The 2017 Renegade has seen improvements in all the right places this year. No matter which Renegade trim level you choose, Jeep has ensured safety, style, and ruggedness all in one. From spacious, cargo-conscious interiors to accented and capable exteriors, Jeep aims to deliver to consumers of all passions with the 2017 Renegade. The Faricy Boys Jeep dealership is located here in Colorado Springs, Colorado. We have a large selection of high quality certified pre-owned and used Jeep Cherokee models, waiting for you to drive home. You can take them out for a test drive, and decide which year of the Cherokee’s fifth generation is right for you. With multiple trim level options, and even more limited and special editions available, you will be overwhelmed by the seemingly endless possibilities that the newest Jeep Cherokee offers. When you purchase the capable Cherokee model used with The Faricy Boys, you will automatically save money without compromising quality, dependability, or the reliability that the Jeep brand is built upon. Come down to see us today, and start on your journey to Jeep Cherokee ownership. Explore the wilderness of Colorado and the Rocky Mountains with ultimate abandon, from behind the wheel of your new-to-you fifth generation Jeep Cherokee. We can’t wait to show you just how capable this crossover SUV actually is, so stop by today and find out for yourself. The experts at The Faricy Boys are ready and waiting to help you uncover the adventurous side of your personality that is waiting for the perfect off-road ready vehicle.